The names of demons (pagan gods) and the demonic saturate American life. One suspects the average American speaks the names of demons several times per day. Where are all of these demons? Hiding in plain sight. 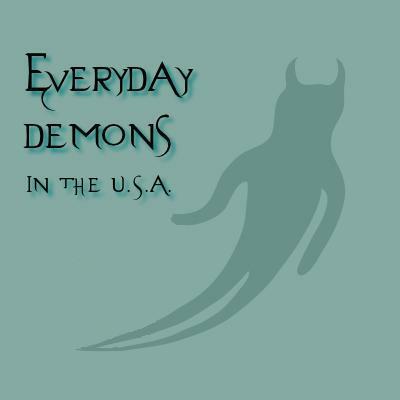 A quick guide to where everyday demons are to be found in the United States of America. IF one lives in the United States, one lives in a land saturated with the presence of demons and the demonic. So many everyday items are named after demons, Americans should feel like they are on a first-name basis with God’s enemies. While it will be hard to name them all, we’ll attempt to run down many everyday things in American life which are named or representative of the demonic. The Bible tells us that pagan gods are really demons. And pagan gods are EVERYWHERE one looks in the U.S. of A. 1- A VERY SMALL partial list of commercially-available products and/or companies named after pagan gods or goddesses. Hermes- Hermes bags/purses. Hermes is also the logo of FTD flowers and Goodyear tires. Atlas- Atlas, a book of maps; also Atlas Van Lines, a moving company; many different companies/products named after Atlas. 3- Most of the winter storms named by the US Weather Service are named after pagan gods and goddesses or other figures from pagan mythology. Here’s the list from 2013. In 2014-15, over half (15 of 26) of the names of winter storms were taken from pagan mythology. Christians aren’t even supposed to SPEAK the names of pagan gods (demons). And yet most of the days of the week and almost half of the months come from pagan mythology. 4- Fairies, elves, brownies, gnomes and trolls: all have roots as popular folklore depictions of demons. ALL such mythological creatures originated as a type of spirit feared by humans. Much of the folklore about fairies revolves around protection from their malice. Although in modern culture they are often depicted as young, sometimes winged, humanoids of small stature, they originally were depicted quite differently: tall, radiant, angelic beings or short, wizened trolls being two of the commonly mentioned forms. Modern media has worked overtime to alter the image of fairies in the American mind (think “Tinker Bell”). Modern entertainment has also labored to soften the image Americans have of elves and other demonic depictions from folklore. Santa Claus is supposedly an elf. Then there are those stories about the tooth fairy. 5- Ghosts and the paranormal. There are no “ghosts.” There are demons seeking to deceive humans. The preceding is not an exhaustive list: it is only meant as a guide. The everyday products, companies, scientific terms, etc. named for demons/pagan gods is everywhere. American life is saturated with the demonic. In movies, in commercials, on TV, in song lyrics: the names of demons are on the lips of the people–and we haven’t even talked about the names of high school, college and professional sports teams. Demons are the enemies of God. Some other forms of the demonic which God condemns. Any reader not familiar with what any of the above terms mean (enchanter, observer of times, wizard, consulter with familiar spirits, etc.)? All of these repeated, nonchalant references to demons fits in well with what the Bible tells us about the end times (those times in which we now find ourselves). There are many, many other examples available (which time and space do not permit their listing). This subject may be revisited in a future article and these lists added to. “I do not want you to be participants with demons. You cannot drink the cup of the Lord and the cup of demons. You cannot partake of the table of the Lord and the table of demons.